BACKGROUND After decades of absence ISOfrane straps finally made a comeback in 2010. Back in the 60s and 70s ISOfrane dive straps were standard equipment for a number of the major dive watch producing brands, among them was Omega, who supplied their legendary Seamaster 600 Professional AKA the ‘Ploprof’ with an ISOfrane divers strap. In those days the design and composition of their straps made a significant impact on how dive watches were worn in the field. Not only were they a lot more durable than rubber straps of that era, but they gave the wearer an unprecedented level of comfort. 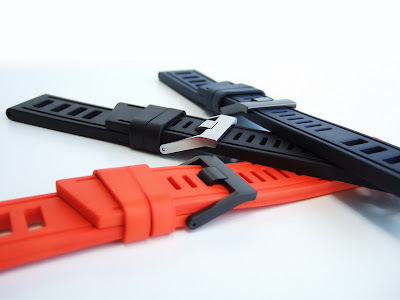 theLOOK Rubber divers straps are pretty nondescript objects; there aren’t many designs on the market that are instantly recognizable as belonging to any particular brand or style. Yes, of course there are some, but I couldn’t sit and rattle off a list as long as my arm. So it’s pretty impressive that one humble strap became such an icon. COMFORT The ISOfrane design with its rectangular windows is almost as iconic as the dive watches it was developed for. The basic design has remained unchanged for more than 40 years, and it came about from one simple need - comfort. 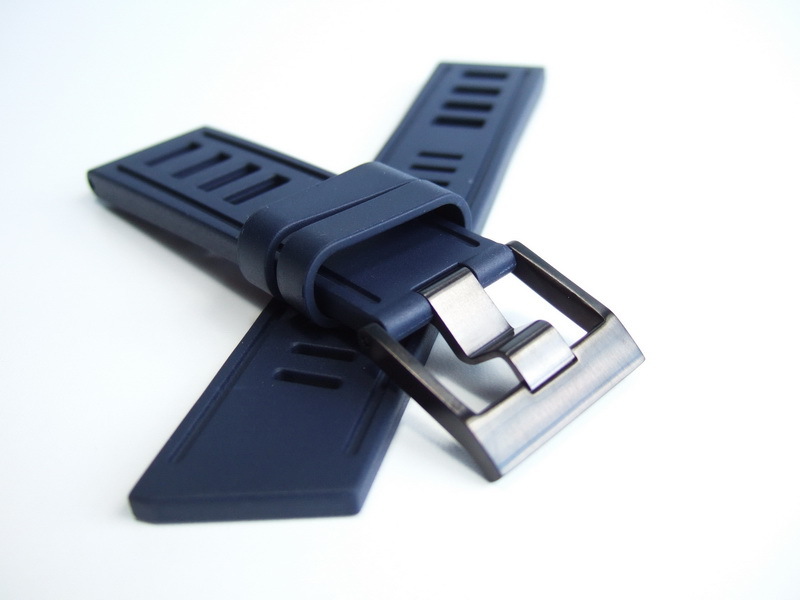 Each piece of the strap has 4 rectangular ventilation windows that work in combination with 13 wide strap holes and a textured underside that allow the skin below to breathe. They also allow water to immediately drain away after exiting the ocean (or bath even). DIMENSIONS ISOfrane dive straps are available in 20, 22, and 24mm widths. The ones shown here are the 24mm versions, which have the following dimensions: 200mm physical strap length, 195mm effective strap length, 24mm strap width, 22mm strap buckle width, 5.5mm thickness at lug and a 3.7mm thickness at end. 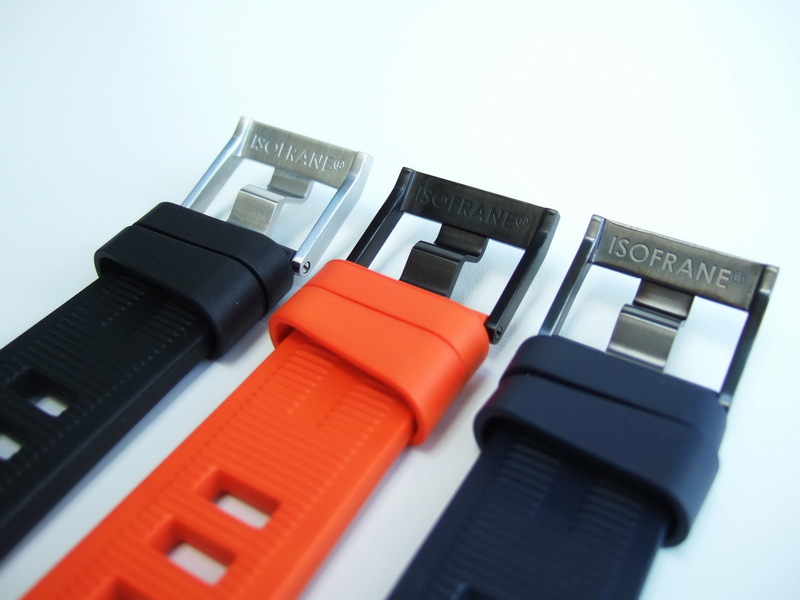 COMPOSITION The ISOfrane straps of the 60s and 70s were manufactured using a compound called isoprene, a colorless, liquid hydrocarbon that is a by-product of petroleum processing and which the strap takes its famous name from. 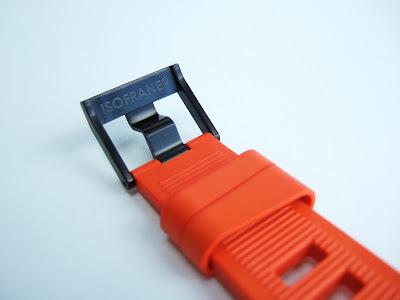 Today ISOfrane straps use an entirely new Hypoallergenic (won't react with your skin) rubber compound that is 100% silicone free. 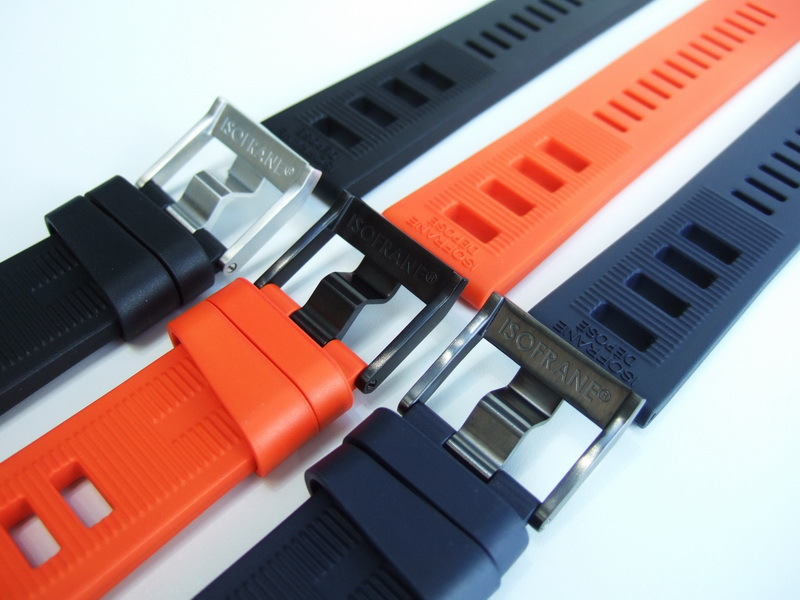 It insures that the straps are softer, stronger and more comfortable to wear. COLORs At the moment ISOfrane only offer three colors: black, blue and orange. They have made a couple of custom colors - turquoise for a Limited Edition DOXA NUMA and brown for the Aquadive BS100 Bronze, so I am hopeful of more colors in the future: grey, life raft yellow, brown and drab or olive green would be perfect! BUCKLEs ISOfrane make two basic buckle types: RS ‘RetroSecuro’, which are forged and then hand finished and IN ’InoxNuova’, which are stamped and then bead blasted. The ones show here are the RS versions, which come in three different Stainless steel finishes: brushed, black PVD, and gun-metal grey DLC. The buckle too has become a signature of ISOfrane. 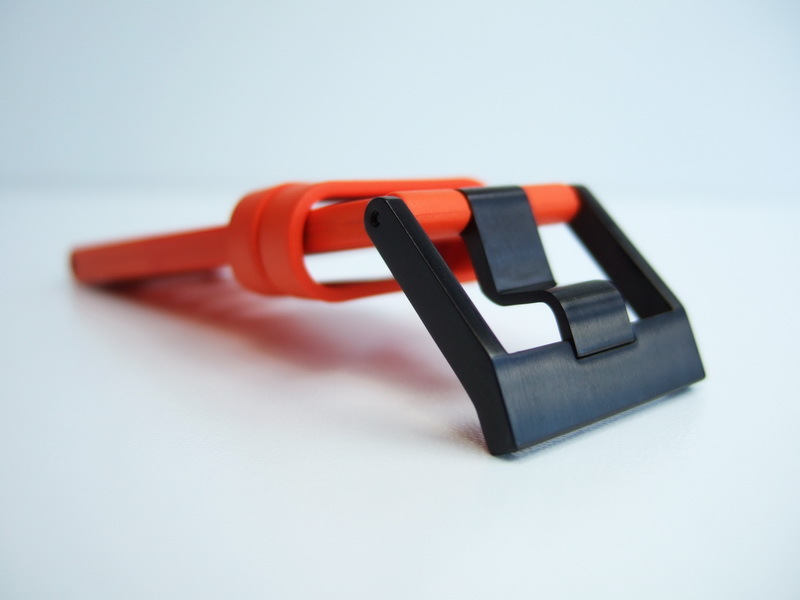 The square shaped buckle is made of two parts, the buckle and its prong. 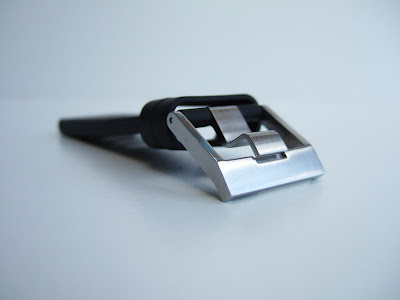 The top flat part of buckle has been angled to allow the strap to sit flush with it. Its underside is signed with ‘ISOFRANE’ name. The rectangular prong, another characteristic trait of ISOfrane is particularly wide and substantial looking. It holds the strap securely in place. FINISH The finish on all three buckles is excellent. The brushed buckle gives the classic ISOfrane look. 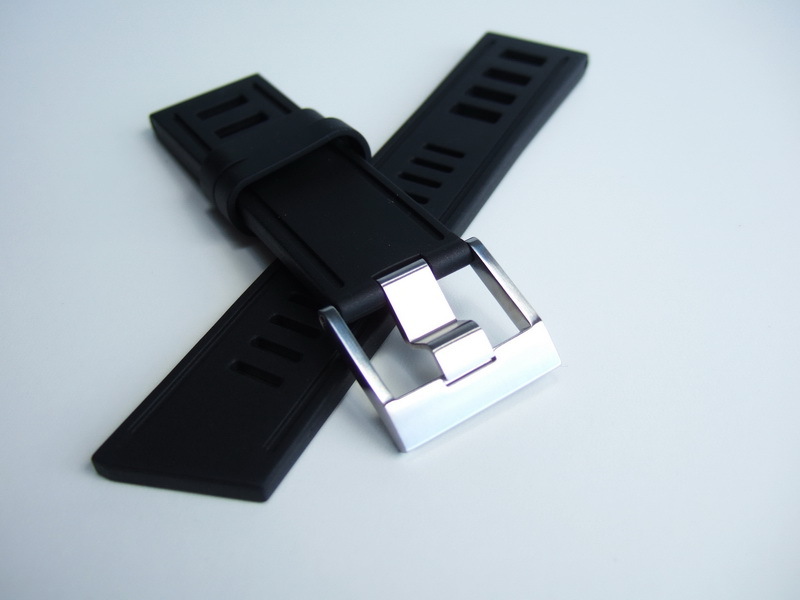 The PVD coated buckle has a lovely glossy black finish. I teamed it with the orange strap for an eye popping look! 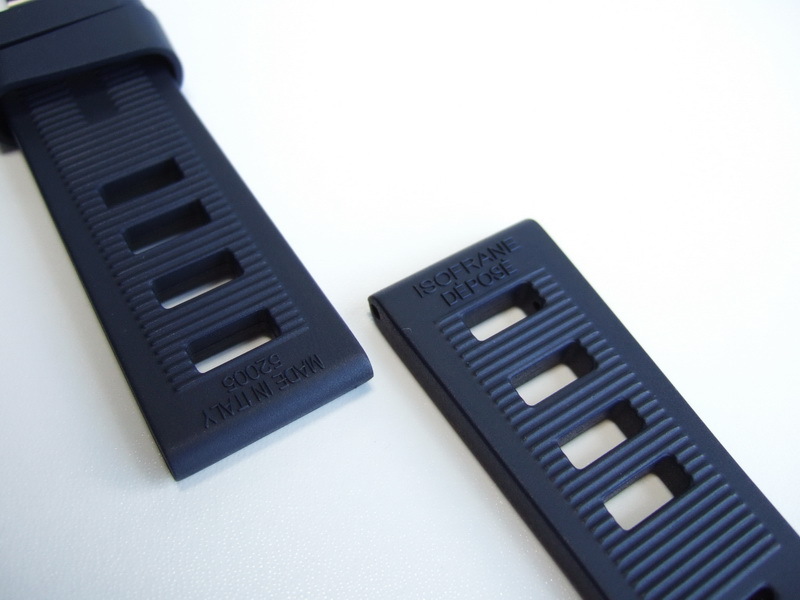 The DLC buckle is in gun-metal grey it fits perfectly with the blue strap. 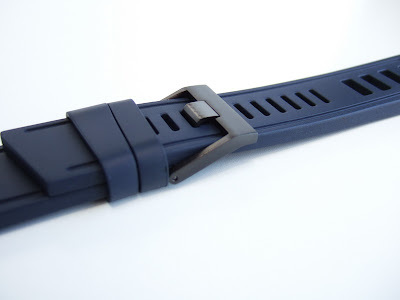 COMBOs The following strap buckle combos are show here: a PVD coated Stainless steel RS buckle on orange strap, a brushed Stainless steel RS buckle on a black strap and a DLC coated Stainless steel RS buckle on a blue strap. 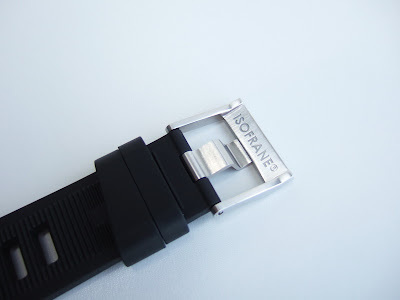 IMITATION A number of the micro brands are supplying their latest divers’ models with ISOfrane-style rubber straps, while they do achieve much of the look they are worlds apart in terms of quality and often have a strong chemical or over-perfumed odor. COST One strap in any color plus an RS buckle costs between 130USD - 140USD (finish depending), which is a little pricey, but not astronomical. 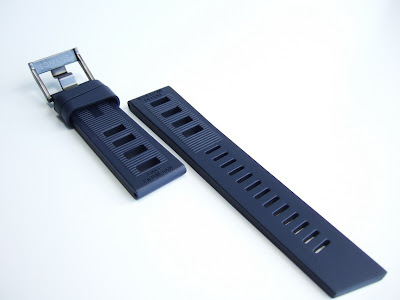 If you compare this to a similar rubber divers strap and buckle that Omega sells for the PO its price is fair. 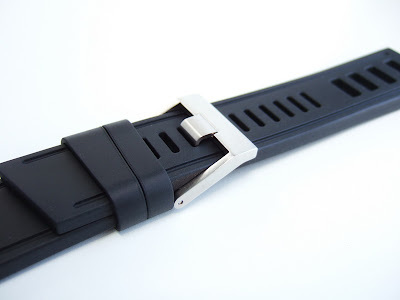 Compared to straps from some of the leading Swiss brands it’s actually very reasonable. OVERALL When you buy an ISOfrane strap you are getting: an exclusive rubber divers strap made in Italy. It has a heritage dating back more than 40 years that is associated with some legendary dive watch names. It is an iconic, emblematic design that has been made with comfort and durability in mind. 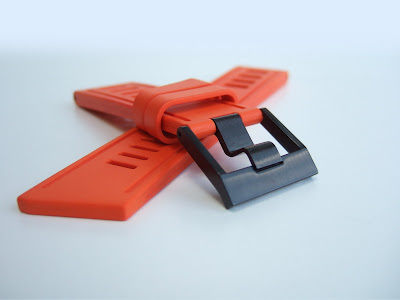 And it is a strap that is in my opinion superior to most other stand-alone rubber straps that are currently on market in terms comfort, quality and prestige. I wanted to see what all the fuss was about – now I know! Get one and try for yourself!